Raw vegetables provide more health benefits than their cooked counterparts, and this raw-food diet is the latest fad amongst serial dieters. But, this is not quite so true! There are many anti-nutritional factors present in certain raw foods, and these get destroyed only while cooking. Like for instance, green leafy vegetables like spinach contain oxalate which inhibits the absorption of calcium and iron; raw soyabean has trypsin inhibitors which lowers the ability of the body to absorb protein. It is also a proven fact that consumption of raw eggs and undercooked meat and poultry poses a threat to the body. Thus it is important that we cook food optimally before consumption. There is no denying that cooking destroys some of the nutrients present in the food. Adopting healthy cooking methods like steaming, waterless cooking, pressure cooking, or stir frying will only destroy the least amount of nutrients from food. Healthy cooking also greatly depends upon the temperature, duration of cooking, and the nutrients involved. Generally minerals are less affected by heat; except for potassium. This escapes from the food into the cooking liquid. On the other hand, vitamins are more prone to get destroyed when exposed to heat, air, water or fats. Vitamin K and the B vitamin niacin are the only two exceptions. They are quite stable to heat. To avoid specific vitamin loss go through the following tips. 1. Vitamin A, D, and E: All the aforementioned vitamins are fat soluble. Thus it is important to keep in mind that while use of some oil during cooking is necessary, excess oil will strip the food of its vitamins as it will get leached into the cooking oil/fat. 2. Vitamin B: This vitamin leaches out into the cooking medium, so make it a point to use the food drippings wisely, maybe in some soup- or sauce-making procedure. Do not subject rice and dals to too much water while cleaning it. Research points out that washing rice even once may strip away as much as 25 % of the B-vitamin (thiamine). 3. Vitamin C: This vitamin is water-soluble and begins getting oxidized once exposed to air. 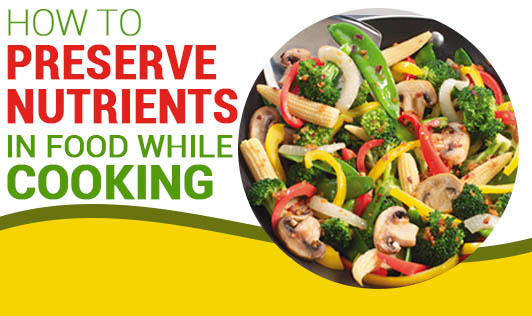 So cook vitamin-C rich vegetables in the least amount of water. Also make sure that you serve cooked vegetables immediately, as after 24 hours they lose almost 1/4th of their vitamin C content, and after 2 days, nearly half. Cooking root vegetables like potatoes, carrots, and sweet potatoes with their skins on ensures that at least 60 % of their vitamin C content is retained.